I am Julie Gross McAdam. 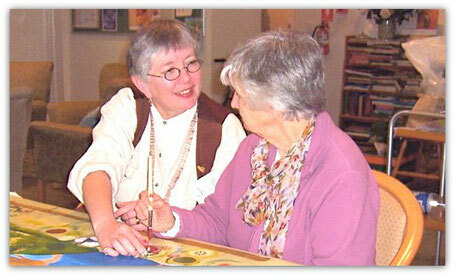 In 2001, I authored McAdam Aged Care Art Recreation Therapy known as the MAC.ART program. Since then I have facilitated the program in both residential aged care and in community healthcare settings in Australia and North America. artworks. My work has also led me to seek postgraduate education and training, including a PhD research project that investigated the relationship between art and wellbeing. My work generally involves older people from all walks of life with a cognitive impairment living in residential aged care. I also work with younger people across healthcare. I have facilitated many communal creative arts projects in hospitals and the community. 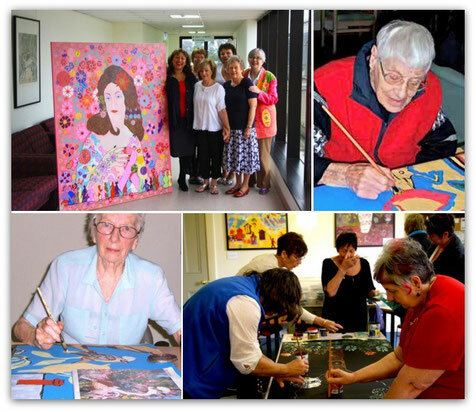 I particularly enjoy working in residential aged care, because it is generally assumed that the forgotten members of this demographic are no longer creative. Even though this assumption is rarely true, the fact remains that, at whatever age, almost everyone becomes bored when starved of purposeful activity. 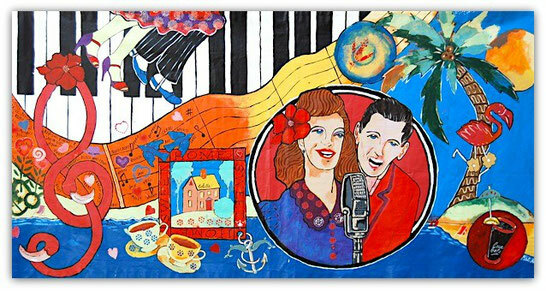 I have met very few who were not creative and even if a person is old, he or she almost always responds very positively to the creative arts therapies when given half a chance. 3. Please share a descriptive snapshot of one of your art sessions, your studio/workspace, and describe the emotional atmosphere of your sessions. I always work one-on-one with people living with dementia in a quiet workspace. This is for a variety of reasons, not least, my concern is to maximize the quality of the experience for the participant. I don’t work in groups, as people living with dementia usually take much longer to process information. And, I don’t use music, either as an introduction or during the sessions, as background noises can be too distracting. There is often a palpable sense of relief when the person realizes that the art activity has a simple structure, and is not beyond his or her capability. I use various welcoming techniques to put the person at ease whilst I lead him or her to the activity. I employ what the art therapist, Edith Kramer, describes as “the third hand”. I use this approach in the following way because people living with dementia are often unable to remember things in sequence, or may not be able to start an artwork from scratch on a blank piece of paper. When the person is presented with a simple line drawing for example, relating to a subject that he or she can make an emotional connection with, then a positive outcome may be more easily achieved. Setting an art activity within a simple and predictable structure relieves performance anxiety. This makes it easier for a person to freely express creativity. I like to describe MAC.ART as an example of storytelling and the art of remembrance. To create a communal artwork, each participant is invited to contribute personal stories from his or her life experience. In effect, both the art activity and the theme are directed by each participant’s life-story contribution. Simple line drawing images from the stories are combined together, and then, each person paints his or her part of the canvas. The theme on completion can be said to represent the life and times of the whole group. One thing that is most gratifying to watch is when an anxious countenance is replaced by a look of relief, as a person leaves behind his or her worries, and becomes enveloped in the total absorption of the creative process. It appears akin to shedding several layers of tight fitting clothing. When the body is free from constraints then the mind relaxes too, and the whole person is open to emotional healing. At this point in time the eighty or more diseases that result in dementia cannot be cured. Alzheimer’s disease is only one of these diseases and today the biomedical sciences focus on finding new treatments for its symptoms. As a result, scientists often say that “nothing much can be done for these people” until a cure is found. Those working directly with people in care know there is a world of difference between, successfully curing a disease and healing the person. Whilst the creative expressive arts are not designed to cure dementia, my experience has shown me that there is great healing power in the way purposeful “here and now” activities work their therapeutic magic. This best describes what touches me most about working with people using the creative arts. Edith Kramer (1916-2014) makes the observation that emotional or psychological healing is not always obvious or apparent to the facilitator. This is particularly so when working with people who live with a language processing impairment. But, over many years, Dr Eric Cunningham Dax, (1908-2008) the father of modern art therapy, observed that human beings, when afforded the opportunity, exhibit a remarkable capacity to “paint themselves well”. 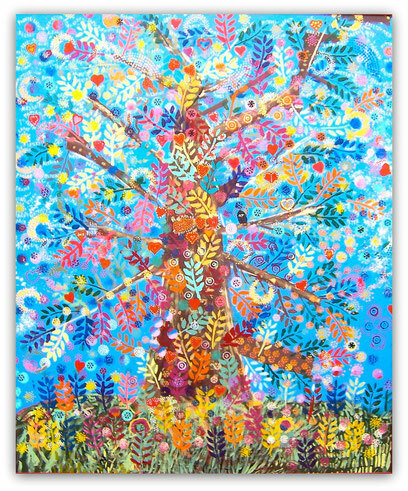 My experience working with people undergoing cancer treatment is that the creative arts, particularly, permanent communal artworks, can give the participant a sense of what Robert J. Lifton describes as “symbolic immortality”. A person diagnosed with cancer is confronted with his or her mortality, and unhappily not everyone survives the experience. a deeper connection to life. On the other hand, the important resolution of longstanding emotional issues may more easily lead a person toward a peaceful death. passed. After explaining what the residents were contributing to, and how valuable I felt the creative experience was, the administrator whispered in my ear, that it was her opinion that, “chocolate works just as well as art anyway”. programs that enhance the wellbeing and quality of life of older people living with these diseases. I am grateful that my life experience has given me special skills to share. These days my role tends to be that of mentor, but my motivation to advocate on the behalf of the disabled has never been diminished. These are probably the unique and defining elements that separate the MAC.ART program, and me, from other approaches. 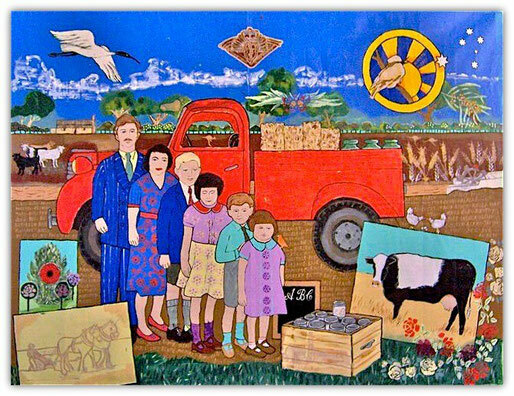 Images of the artworks with the individual story of their creation may be seen at www.macart.com.au. Numerous articles may be found on the Internet.